Here we are at the 4th week of my one year birthday celebration...yes...NIFTY THRIFTY TUESDAYS is now 13 months old!!! I have another awesome GIVEAWAY for you all this week...it's a darling FLORA DOORA bag from Jane. I know that some of you are already friends with Jane and have some of these cute bags already in your home, but if not...then be sure to go by and meet her and check out all her other bags in her Etsy shop. These cute little bags would make wonderful Easter baskets...filled with goodies for your loved ones. This week I'm going to share (show off..he he) one of my all time favorite THRIFTY treasures. Last week I headed down to my beach condo and on the way there I hopped in at the Restore shop and there she sat on a shelf...just waiting on me to find her...now what could she be? She is a darling little spice rack...my first thought was that...she looked like she came right out of a POTTERY BARN store (maybe she did). Funny thing is...I had just came from Pottery Barn and while I was there...I got soooo many wonderful ideas, that I will be using around here at my nest. The next best thing was her price tag...get this...she was only $2.00...yes...two bucks and she was heading home with me. Take a look where I have her for now...I'm sure that she will get moved around a lot here...that's just how I do things here at Coastal Charm. Okay ladies...what have you found lately? Looking forward to seeing all your treasures...makeovers...and thrifty ideas...so link up and let's get this party started. Isn't she is the cutest bag ever? * 2 entries-follow Jane over at FLORA DOORA and come back and let me know. * 1 entry- become a Coastal Charm follower... would love to have you as a blog friend and reader. 2 Extra entries -link up to NIFTY THRIFTY TUESDAYS and leave a comment. 2 Extra entries-blog about the giveaway or add it to your sidebar and come back and let me know. See why I fell in love with her! Look at her cute little labels! Oh, leave the labels on. They are great. You can always turn the bottles for the times that you don't want to see the labels. Great find. Thanks for hosting the party! The jars are so cute! I love the sweet bag. Also love your jars and the way you've used them to display flowers. I'd take the labels off. Darling bag and great wire carrier. so cool. Thanks for hosting! Linda...I love your spice rack! What a perfect idea for it and place for it too... Looks fabulous. Your bag giveaway is super cute too! Love your giveaway -- count me in! I LOVE Nifty Thrifty Tuesdays :) I linked! And great giveaway!! And I follow here of course. Love your pretty window display! Love that spice rack! And the price is knock 'em dead, too. You always find the niftiest things. I'm linking up a quick sewing project this week. Thanks for hosting this party each week, and for hosting this giveaway. I'm a new follower over at Jane's and I've been following you for a while. I always love seeing what treasures you bring back from your shopping trips. I say remove the labels! I love it as a bud holder. So darn cute! I can't see Mr. Linky?? Great find! I love that bag and how you have decorated it. Love the spice rack... leave the labels on they add character. I love your meme! I have never participated in it before, but I will now! Such creative thrifting and ideas! I love Jane's flora dooras. I have several and love them to put little gifts in. I am a new follower of Costal Charm and have been a follower of Flora Doora for a long time. What a fun stop. NOw off to check out more entries. I'm a follower of yours!! I link up to nifty thrifty tuesdays! Love the spice jars and rack! So cute! I was in PB on Sat. and came home with many ideas and loved it all! Their Spring decor is so lovely this year. Oh your spice rack is a great find. So thrifty and so perfect for your space! I am a faithful friend and follower of your and find you totally charming! I am a follower of Flora Doora and have also jsut visited her and left a comment. Sue would like to win her little Flora Doora! OOO, yes, ma'am...I can see just why you fell in love with that adorable little spice rack. It is precious. I linked to your party. Hope you don't mind me linking my giveaway...it's thrifty to the person who wins. Actually, I'm away this week. My stepmother, the last parent I have, has finally agreed to go into a retirement place. So my sisters and I are packing her for her move in a few weeks. She will be able to take quite a bit with her as we were able to get her a nice apartment, then we will have to get the house ready to sell. She lives about 275 miles away so I will be back and forth the next few weeks. Maybe I'll find so thrifty things while I'm away! I love your spice rack...she would have come home with me too! I would probably take those labels off. I might make new ones for the spices I use most often, or even use some of the chalkboard paint to create new labels. I love the simplicity of those bottles with the labels, so pretty! Hi, Linda! I was just dropping by to say that I thought about you as I strolled on the beach in Gulf Shores Saturday morning. We only had two nights there, but it was wonderful! labels are wonderful too! I would keep them! your giveaway! I love Nifty Thrifty Tuesday! Thanks for hosting! I linked up and I am already a follower. What a great giveaway! Nice find! Definitely leave the labels on. Looks so beautiful with the flowers. I linked my thrifty finds and I am a follower. Love the spice tray, can see why you pick it up!! I already follow you and Flora Dora and I am a very happy follower of you both! Have a great week! What a great find those bottles & their rack turned out to be! I know you'll be using them for years to come...lots of ideas come to mind, but I really like your camellias for starters. I'm thrilled to be able to join your fun meme this time around. Its been too long since I could *play*. Thanks for hosting it again & again! I am a new follower of yours and now follow Jane at Flora Doora. Thanks for the awesome giveaway! This is my first time visiting your blog. Will be following you! Love the spice rack. Definitely labels OFF! Linda, I am loving your new find, and I would remove the labels, only so I could put something more floral related, that's just me...and I would use it exactly as you are. That is a gorgeous piece and I love it! Good eye lady! I truly enjoy to be part of your Nifty Thrifty party. I just wish I have the time and room to accumulate great treasures like others. Very inspiring! Good morning Linda. love the spice jars so much. Leave the labels on PLEASE! smile. The bag is adorable too. You gotta love thrifting huh? Congrats on 13 months of your fun meme. A great deal of bargains have been shared because of you. Thank you for your great idea. I am on my way to Flora Dora I may be a follower already. Linda, I am letting you know I am a follower of Flora Doora and you. I love both blogs! I would love to be entered in your giveaway. Went to Flora Doora - now have to go shopping :) woohoo !!!! Thanks Linda, it's been a while since I joined the party! Good to be back...! 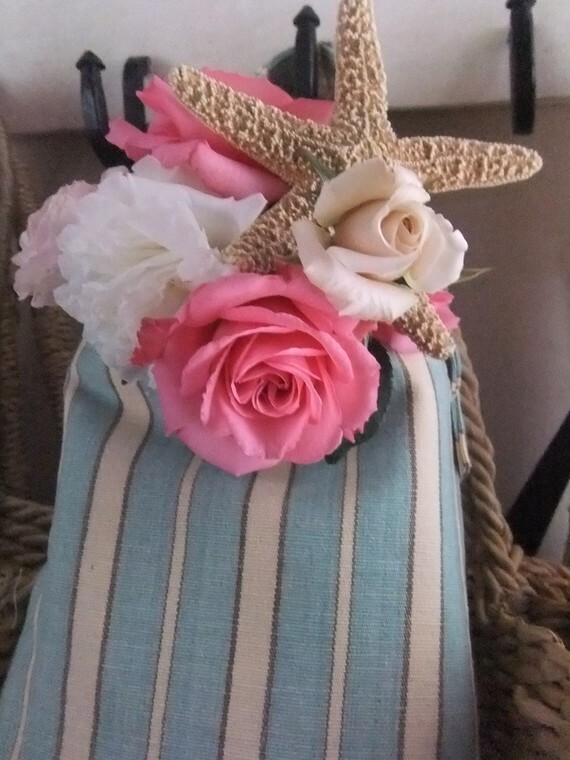 I love the flora dora bags..., especially the sea inspired striped ones. So unique!!!!! Thanks for the chance to win. Love the flora dora bags! Thanks for the giveaway. Not let's get to those spice bottles! I adore them! Leave the lables on, they are so charming. You can always tuen them back wards like you did when you don't want ot see them. I'm just afraid once they are gone they are gone and you may be sorry one day....so KEEP the labels!!! i am in love too!!!! Linda I love that basket of bottles! Only $2! Girl you scored. Love them with the flowers in there! Thanks for hosting! I am a follower of you blog! I am a long time follower of Jane at Flora Doora! I love her bags and would love to win this one!! Hi Linda, I'm a new follower here at Coastal Charm - I found you through another Linda @ A La Carte. Having such a lovely time visiting other Nifty Thrifters!! I mentioned the giveaway in my blog post and added it to my sidebar! Thanks for all the chances! thanks for hosting, linda! i am a little late to hte party but i had nothin' til now! Oh the cuteness!! Thank you for the contest!! +1 i'm a follower of coastal charm! I also love the jars!! Love her bottles and the bag is too cute. I linked up. Thanks for hosting. I visited Flora Doora and became a follower. I linked up my Thrifting Highs and Lows post, #190. I'm late but I finally made it to the party! Thanks for hosting! Hi Linda! Oh, what a cute little basket and that bag is adorable! Thank you so much for popping in to see me. I have joined the party! And we are searching a house rental in Gulf Shores. I forgot where yours is? Do you know of any leads for second week in June? Hi Linda, The spice rack does look straight out of PB and I love it! Thank you so much for sharing this at my party. The bag is adorable and I can see this filled with Easter goodies. Thank you SO MUCH for linking up to WHASSUP WEDNESDAY!!! Great entry:) Im DROOLING!!! I am a follower of Coastal Charm! I visited Jane's beautiful blog and am a follower there as well! That bag is so pretty!